When we got back from the old world, I tried to book a string of shows and make 108 actually happen. It was something I had never done before and have never done again. The first show would be on Saturday, October 10th at the Unisound in Reading, Pennsylvania with Another Wall and one or maybe two other bands. 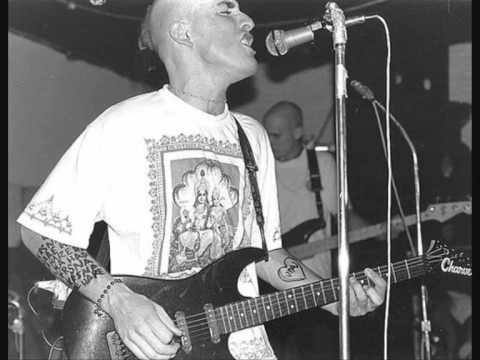 The next weekend we would do a Friday program at the Baltimore ISKCON temple, a “108 Spoken Word.” It would be a regular Hare Krishna event with kīrtan, “class” and a “feast,” but the subject of the classes would be our lyrics. We tried to book a show somewhere nearby the day before… but that was unusuccessful. That Sunday, however, we managed to book the Apocolypse in Norwalk, Connecticut, this time with Supertouch, Another Wall and one or two others. We planned to hold another spoken word somewhere in Norwalk the next day… but that never worked out. The next weekend had two shows: Saturday in Dayton, Ohio with World’s Collide and Endpoint; Sunday in Bloomington, Indiana at a place called Rhino’s, with a spoken word the next day. The Friday after that we planned to do a show and spoken word in Columbus, Ohio. I put all these dates on a flier with the 108 logo, a picture of Rādhā-Krishna I had drawn myself, a notice that our delayed 12” EP would finally be out in November, and an address for inquiries and interviews. Norm Arenas had recently moved into the temple, so we got him to play second guitar, planning to do all these shows as a five-piece, but before we could even practice with that line-up, Rob quit. That left us without a singer… a week before we were finally supposed to play our first shows. I wouldn’t admit defeat and decided to sing and play guitar. The first show, at Unisound, went surprisingly well. I wore my bleach-splattered black pants and a cool shirt with Lakṣmī and Viṣṇu seated together on the sea-dragon, Ananta Śeṣa. With a thick black marker I had drawn the Hare Krishna mahā-mantra around my right forearm, and wore a bracelet of red, shiny beads that the Rādhārānī deity in D.C. had worn. On the inside of my left forearm I drew a heart with the word “Vraj” in it. We played practically every song from the Holyname record, plus a few songs I had written since then: thorn, hostage:i, and woman. I drew up and handed out a flier with 108 lyrics on it, and explained the songs from the stage with semi-psychotic Krishna-banter. Previous Why Did Rama Abandon Sita?